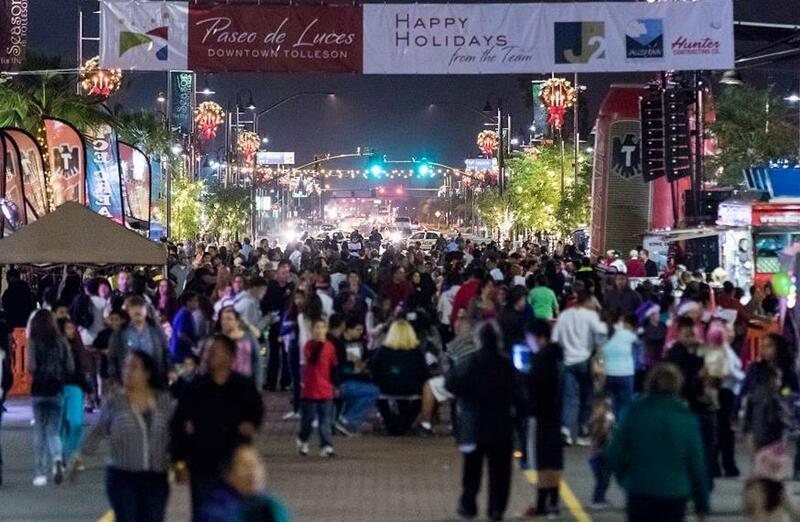 The 2014 revitalization project of Downtown Tolleson into Paseo de Luces has spawned into an entertainment destination that people want to experience. 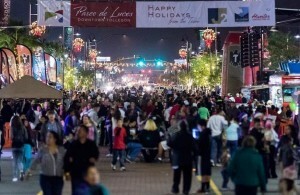 Paseo de Luces (Path of Lights) is more than a downtown; with its family-style seating, it has become a gathering place for all people. 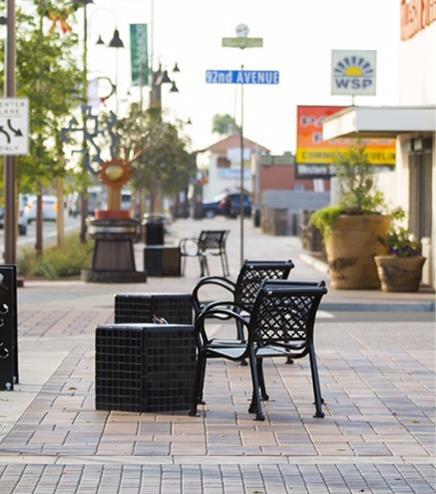 Visiting Paseo De Luces offers the opportunity to enjoy an amazing art collection designed and fabricated by West Valley Fine Arts Council’s Gallery 37. 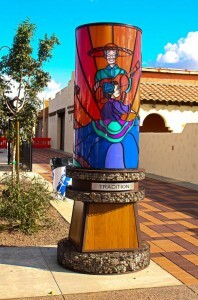 This collection consists of seven sculptures that comprise the Paseo de Arte (Path of Art), which embodies the city’s past, present and future. 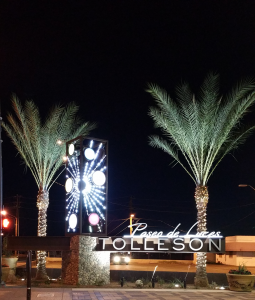 In 2015, the West Valley Arts Council recognized the City of Tolleson as its Champion of the Arts for including this art collection as a staple in the new downtown design, as a symbol of the community’s commitment to the arts. In addition to this remarkable artwork, Paseo de Luces has a Central Plaza with a water feature, free Wi-Fi and a sound system that plays music all year long. 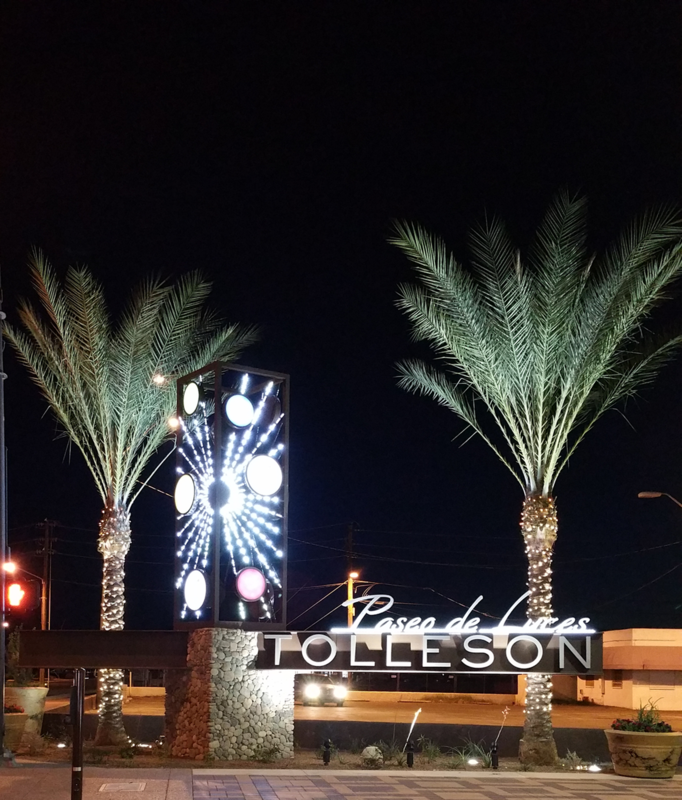 Posted on September 15, 2015 by League Staff in Arizona's Downtowns | Tags: Arizona, Arizona Cities @ Work, Arizona's Downtowns, City of Tolleson, Downtown, Metro Phoenix, Paseo de Arte, Paseo De Luces, Public Art, West Valley, West Valley Fine Arts Council | permalink.